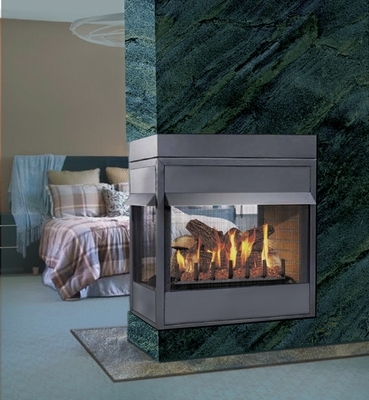 The Gemini Series System see-through can be used for two room fireplace or fill an empty corner space with the luxury and charm of a breathtaking fireplace. Our sandless five burner system offers a unique and spectacular appearance, with the warmth and beauty of a real wood-burning look. Available in your choice of Charred Split Oak , Adged Oak or Red Oak and other custom options available by phone. Available with or without a factory- installed: safety pilot, millivolt valve, hand held remote control, or electronic Ignition. *Sandless 5 burner- Specifically designed diverters and baffles disperse gas to provide a livelier, more natural-looking fire. No sand maintenance required.